FishEye Sportfishing is an authorized Gray Taxidermy Representative. A mounted fish from Gray Taxidermy will commemorate a memory of a life time. Our world-class artists take pride in reproducing the rich vibrant colors and true beauty of each species in every mount they create. Our goal is to recreate your fish to resemble the way it looked during the memorable day you caught it. We have been in the marine taxidermy business for over 50 years. With over half a million fishmounts created we have the knowledge and experience to craft the ultimate fishmount. 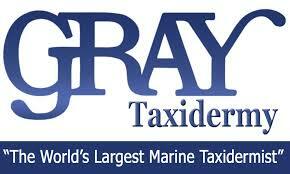 At Gray Taxidermy, we are fishermen and women that are totally dedicated to the industry we work and play in. Our artists are handpicked and experts in their own craft. They are here for one reason only, to handcraft a world class product that will last a lifetime. All mounts are handcrafted in the U.S., one mount at the time, making each and every one of them unique. Contact Capt. Brandon at 727-243-4082 to learn more about getting a trophy mount.